Protein pancakes are a great alternative to traditional breakfast options, especially if you are trying to reduce your carbohydrate intake. This recipe allows you to enjoy the taste of pancakes without overloading your body with calories and sugar. 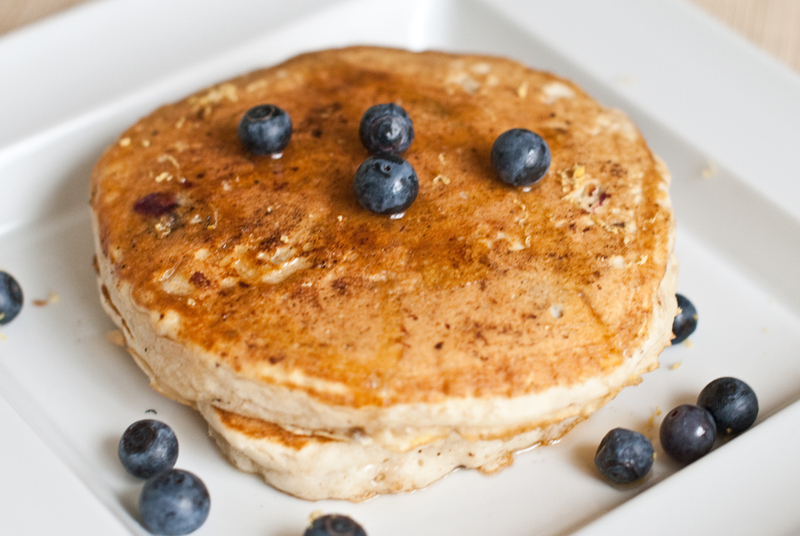 Healthy pancakes are an option your entire family will love. Throw everything except blueberries in the blender and blend until smooth. Spray pan with safflower (or other) oil and get it hot like a griddle, pour half of the mixture into pan, and place a few blueberries on top. These pancakes won’t “bubble” on top like regular pancakes, so you need to watch the bottoms. When bottom is lightly brown and the pancaked is cooked halfway through, flip and cook the other side – this will also heat the frozen blueberries. When done, remove pancake and pour in the rest of the batter, repeat.